This second of five interviews with top U.S. cyclocross course builders features the man behind this weekend’s KMC Cross Fest. Patrick Goguen, the oldest of 10 siblings in a bike-racing family, has shaped parcours for this event since it was located in Providence, R.I., and followed it to a new venue last year in northeastern Connecticut. 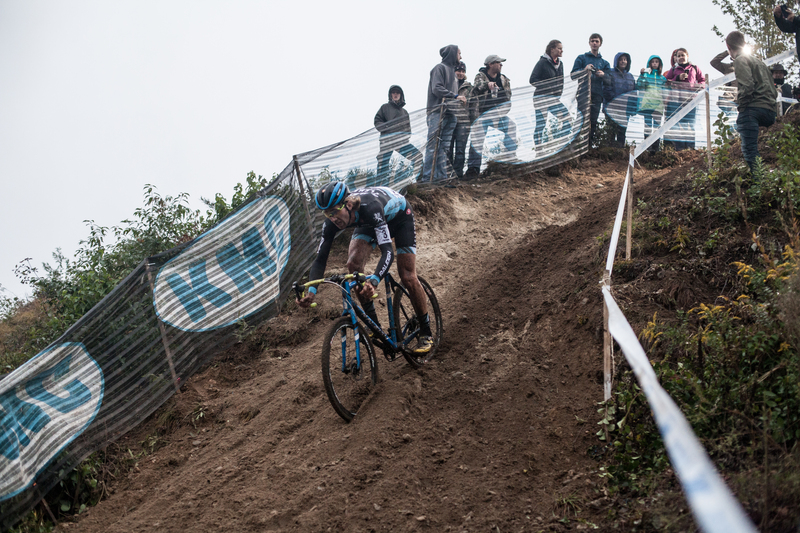 He spoke with soon-to-be Belgium-based professional cross racer Andrew Juiliano for this feature, which first appeared in abridged form in ROAD Magazine. All photos © 2016 Brett Rothmeyer. 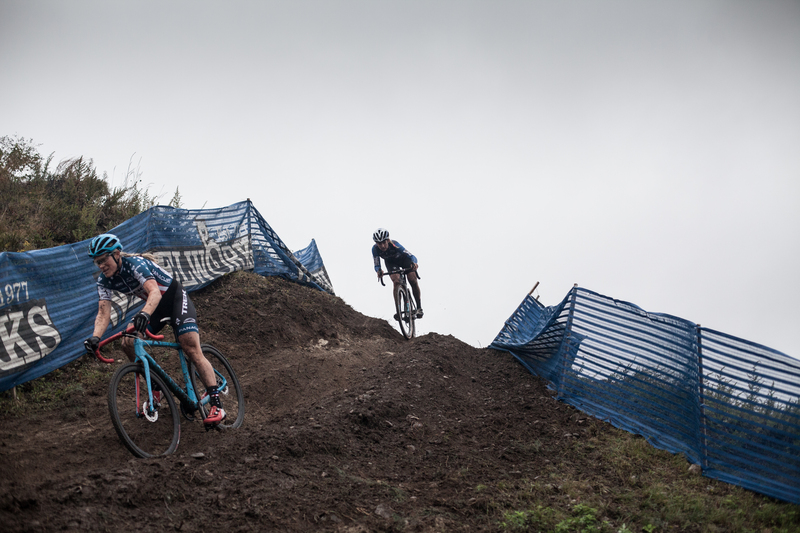 What’s your background in cycling, cyclocross and course design? I started riding when I was 15 or 14. I got an old 10-speed bike for my birthday, and my dad used to race this local unsanctioned training race on the weekend. We would go and watch him after church. Then I got a bike, that 10-speed, and I ended up saving up buying my own real bike that summer and started riding and racing with my dad at this training race. We joined a local New England bike club and from there I raced and struggled through juniors. I slowly moved up through the ranks and fought through each category in the road scene. I started ’cross like two years after road when I was 17. I ended up Cat 1 on the road when I was 25—I was Cat 2 for, like, ever. That was kind of when work was really picking up and I couldn’t train as much. I stopped racing ‘cross as much and more supported my family’s team [Race CF]. We started a team to raise awareness for cystic fibrosis, which two of my brothers have. I’ve supported the team the last five years or so, and that is also when I got more involved with the [now KMC] Cross Festival in Providence. Before that, I just made courses in our backyard and in the woods. I helped out with some local training races, making courses and trying to make things more interesting and difficult. How did racing influence your course design? When I did race ’cross, [I liked] things that were not quite rideable or where only a few people could ride. Also, I liked having lots of different line options. For me, it was so much fun to be able to outwit my competition by taking a better line or figuring out how to ride something that other people couldn’t or choosing to run something that everybody was riding. I bring that into my design by trying to make a course that really makes you think. I started with Providence Cyclocross Festival five or six years ago. Then they brought me on staff and I took over with Tom Stevens. The last couple of years, my brother Manny has been kind of taking over for me as I’ve moved up into more of a program director for the event. What was your goal when you designed the KMC Cross Fest course? We put a lot of thought into keeping the racing exciting for spectators. We always try to have it be really close pack racing, where a mistake can mean a lot and anyone can be leading. We try to have it be fast and flowy and fun. The first half of the race is close, and then there is usually some technical aspect that ends up being the real key feature. Once you get a little tired and don’t ride things just right, that’s it. We’re always trying to push the limit and make something that riders haven’t seen before on a ’cross course. We want to challenge them and make them think and maybe scare them. We had some success this year  at KMC with the sand trap hill. Jamey Driscoll descends at KMC Cross Fest 2016. What’s your course building philosophy? I see different features that are really great around the country and in Europe, and I want to add those and improve upon them and make them more extreme. The track [at Thompson] is really receptive to that, and I feel like I finally have a place that we can really do what we’ve dreamed of doing for courses and take it to the next level. Not just trying to be the most European, but be what American ’cross should be. I want to make American ’cross and I want it to be beyond and different than what they have in Europe. I feel like a lot of people are trying to be the most Euro course, but I want to make it American and extreme in our own way. We have the X-Games and everything else, and they’ve got a tradition and stuff there. I think there is room to make ’cross our own through the features and stuff. I don’t try to make it as European as possible. I want to go beyond. [Europe] did something that was cool and now we need to do something cooler. Why just copy them? When you say ‘European’ what do you mean? I think it’s a common thing that people say [“European”] to mean “hard” and “pro.” Typically, a lot of the American courses are much mellower than the World Cup courses you see in Europe. A lot of it has to do with the weather. They have so much mud all the time. Also the competition is so much better there. Their courses are harder, their off-cambers are bigger, especially their drops. They go down stuff, like that sand hill we had in there, that’s nothing over there. I guess that’s what I mean—[“European” means] more extreme, more intense, bigger drops, more sand and a level of difficulty that’s beyond most of the American courses. I want to do all that, but I don’t want to emulate what they do in Europe. I want go beyond that and come up with our own stuff. What are you thinking of in terms of new things? In the mountain bike scene and downhill, they build these big wooden banks and stuff. In CrossVegas they tried to do this little wooden velodrome thing that frankly was kind of stupid and pointless, but I like what they’re doing. They’re introducing something that is different from Europe and something that we could do. Like we built the jump in Providence, which again was stupid and didn’t bring anything to the course, but it brought huge entertainment value to the beer tent. You could hear cheers across the whole thing when the guys in the back were just having some fun. American ’cross could involve building features out of wood, making drops, banks and fast stuff like that. Making twists and chicanes that give skilled riders different options and passing lines that will be really fun and high-speed. That’s something that I envision as part of American ’cross. That bigger, faster X-Games type of feel that will be appealing to the American audience and not just the fans that are there to cheer for the lead rider. It’s cool to have stuff like that where you can see a cool pass back in 40th or 45th. You basically want to bring more of an entertainment factor to an audience that may not appreciate the sport because they understand it, but because it’s fun to watch? Right, because it will never go anywhere if we don’t. The competition is too high here. We’ve got a million-things-a-minute on our mobile devices and hobbies and sports and F1 and Go-Kart racing and paintball. There is so much to do and Americans always like new stuff. We really need to be smart. That’s why I hate when people say, “Make it more European.” A lot of people who love the sport and watch the European races love the idea. This isn’t Europe. We can’t just go out and make a European course that only the pros can ride and then go bankrupt because our money is mostly from amateur racers. If we can make things that amateurs can have a ton of fun on and are just as challenging to pros, like optional lines, that would be great. The drops are a big thing where we have pro-only sections, but we could do a lot more with them. Like drop when you want to, and if you drop in early, it’s going to be really steep and hard, but it’s going to be the faster line, sort of those A or B lines. If you get amateurs that want to race the pro course they can do it, but also they don’t feel like they are risking their life. It’s keeping the whole spectrum of ability in mind since amateur racing is so critically important to American ‘cross. By no means should we dumb down the course for that, but we need to just be smart about it and keep it in mind. Are you envisioning having a pro line and amateur line combined into one? Is that a better solution than a pro-only section? Yes. I think both. There is an appeal to pro-only sections and there is a lot you can do with pro-only sections. You get entertainment value with the pros warming up. I think that having one or two pro-only sections combined with alternative amateur lines on the rest of the course is what I would like to see done. It takes a lot of thought, planning and judgment of what people can ride. I took out the 12-year-old girls and my brothers that are racing the pro race, and had them all ride things at KMC, and I saw how riders of different levels think of the lines. If you mix it all together I think there is so much you can offer on a ’cross course that isn’t being offered now. Do you think that courses in general are challenging enough in the U.S.? I don’t. You do hear a lot of people say that, especially the pros. In the last few years it’s been a theme that they want things harder and more Euro. I think that a lot of designers have listened and we’ve gotten a lot more legit courses, which I’m encouraged to see. It is changing, but in general we still have some total grass crits, like Vegas. Even some of our more famous races in New England are just not challenging enough to maximize what the sport has to offer really. I think it’s a shame really. There is so much more we could do with the sport. I like seeing the direction it’s going and I want to see the creativity grow. Katie Compton leads Ellen Noble down a descent at KMC Cross Fest 2016. The Pan-Am [Championship] course is really cool. The World Championship one too in Louisville. My brother said it was really fun, and my dad said it was hard to walk in some sections. Asheville Nationals [in 2016] had some really cool stuff. The venue was great and the course was definitely one of the better courses I’ve seen in the country. I haven’t been to Iowa where the World Cup course was. I’ve heard it was awesome, but again I haven’t seen it. I know the New England courses better, like NBX, which is in Rhode Island. It has these beaches and those are awesome. I think that they are vastly underused. That’s another thing that I would like to see—people making courses unique. Like you have Koksijde in Belgium, and it’s all sand, and it’s awesome, and that’s what it’s known for. Like, if you’ve got a huge beach, be known as the beach. I think it’s cool and I think there is a lot of copying where every course is the same kind of thing, but I would like to see us get away from that and be unique if you can. Is Koksijde your favorite international course? No. I mean, I don’t know if I can say that I have a favorite because I’ve only seen them on TV, so I don’t think that it’s fair for me to pick a favorite. In Zolder, it’s more like that the competition makes it awesome. Like when you’re watching van der Poel and van Aert going head to head and hitting sections and attacking each other, you remember those courses and sections because of that and that’s what makes it awesome. I love watching the features. What’s one thing that you think the general racing population doesn’t really appreciate or think of when they think of course design? What’s the behind-the-scenes thing you want to share with the world? Another consideration is the flow of thousands of people coming in and out of a race venue. There are only 100 people on the racecourse and there are a thousand people and big trucks and trailers and tents that are going outside the course. Figuring out the logistics has a huge impact on what we can do with a course in a given venue. I think that’s hugely overlooked when the general public is critiquing a course. I don’t want them to be any more lenient though. I love hearing the criticism and suggestions. It’s nice when people respect the challenges and I do appreciate when people know how many things we are juggling.